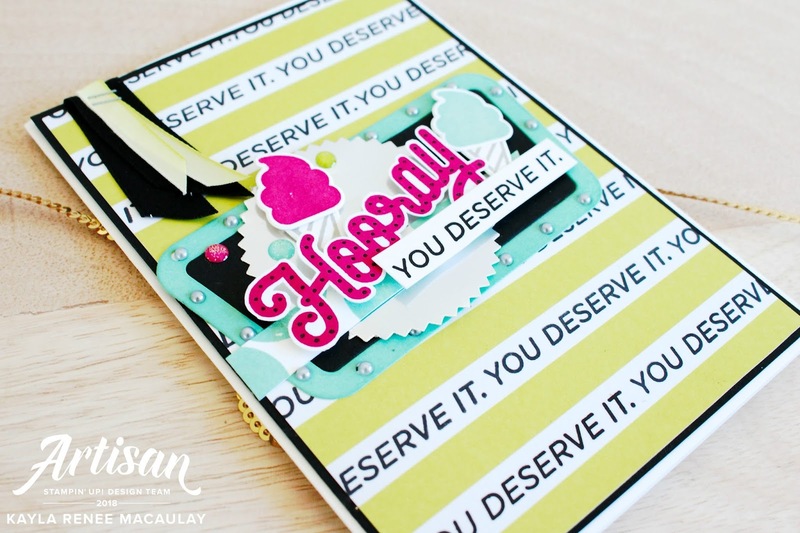 Hello and welcome to another Artisan Design Team Blog Hop. You are visiting Kayla MacAulay from Tasmania, Australia. Thank you so much for visiting my blog. Today the Artisan Team are featuring the Broadway Bound suite of products and they are just gorgeous and so addictive once you get playing with them! I really enjoyed making a whole array of cards with these gorgeous products in some really fun colours. Be sure to check the bottom of the post for links to all the other gorgeous blogs and links to all the supplies that I have used. I have made a total of six cards and really had a blast making them. It's a great bundle and suite for birthday and congratulations/well done cards. I hope I can provide you some inspiration. These first two cards that I made were a lot of fun. 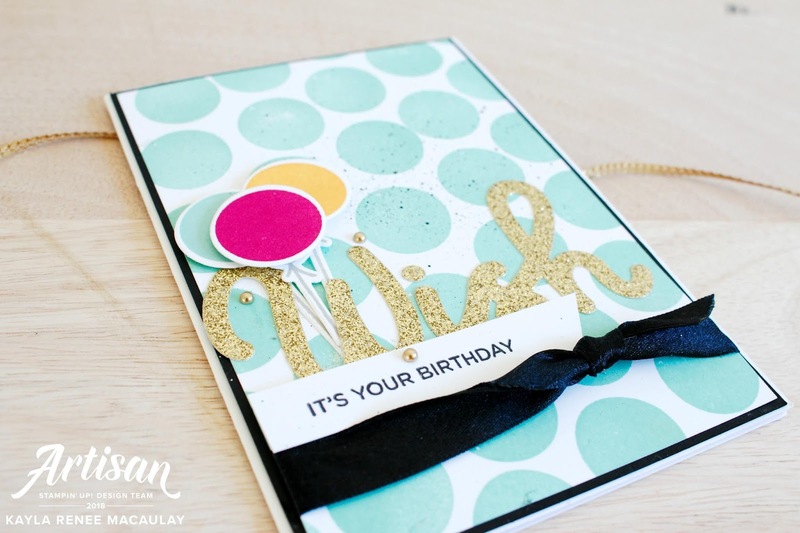 I used the 'balloon' image from the stamp set to repeatedly stamp a spotty background using my absolutely favourite colour Coastal Cabana! I also used a 'spritzing' technique using my Basic Black Stampin' Write marker totally inspired by the gorgeous Dena Rekow. I accented the card with some Basic Black Shimmer Ribbon, some Metallic Pearls and some gorgeous Gold Glimmer Paper which I cut with one of the coordinating dies. The second card in this set I used the gorgeous marquee sign and created a shaker card. 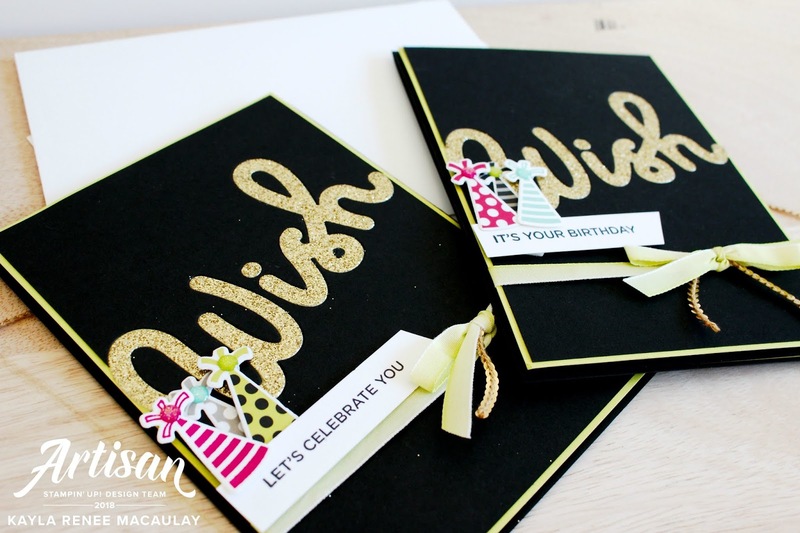 The dies that coordinate with this suite are just fabulous and make such fun shaker cards. The other really awesome coordinating product is those Metallic Pearls, as they fit so perfectly in the 'dots' of the marquee sign for a fun look! I accented the card with some linen thread and stamped images along with some of the gorgeous Candle Embellishments, also from the suite. Here's a bit of a close up look at the finished 'spotty' card. This is probably my favourite, but I will admit that the coastal cabana is what sucked me in! That colour is gorgeous and could go with anything! Here's a look at the next two cards that I made and I really focused on the gorgeous Broadway Bound Specialty Designer Series Paper. The really awesome thing about this paper is that it has foiled designs on every single piece! It's a must have staple I think, with all those gorgeous designs. I once again used that gorgeous marquee sign on both cards and accented with lots of bright colours like Lemon Lime Twist, Lovely Lipstick and Coastal Cabana! I also brought in those gorgeous Glitter Enamel Shapes for some fun glittery colour! The Lemon Lime Twist card features a design on the coordinating paper and what I did was take one of the stamps 'You Deserve It' and stamped it repeatedly in the stripes. I wanted to create something that wasn't a birthday card, and so instead created a card that would be perfect to give to one of my team members when they achieve something awesome. Here's a bit of a close up look at the Lemon Lime Twist Card. 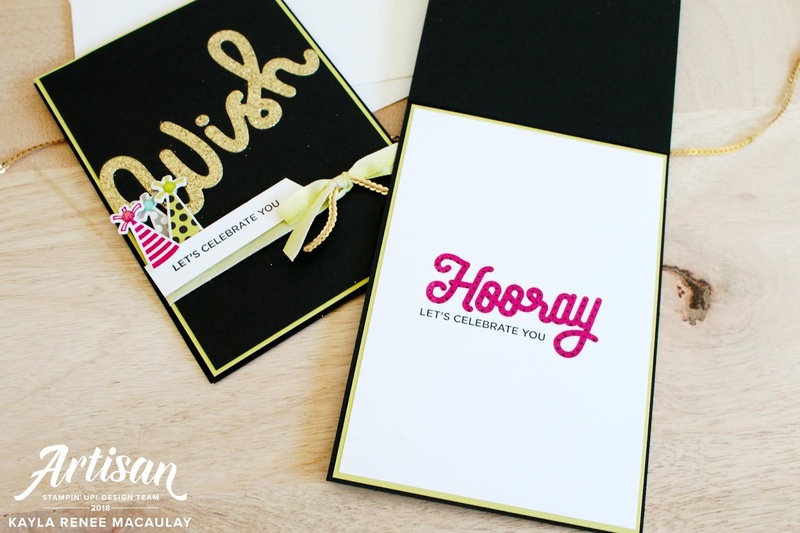 I love that the Hooray and Wish stamps give you the option of adding the dots to make them like marquee words. It's a pretty nifty idea and you could combine so many colours when doing that. I've gone with black for the dots but it would look equally great stamped off and then full strength when stamping those dots! I also used a mixture of the Shimmery Black Ribbon with the Lemon Lime Twist Ombre ribbon to accent the card in the top left. I adhered the ribbons with a staple. Here's a close up look at the first four cards I made. They are so bright and colourful! 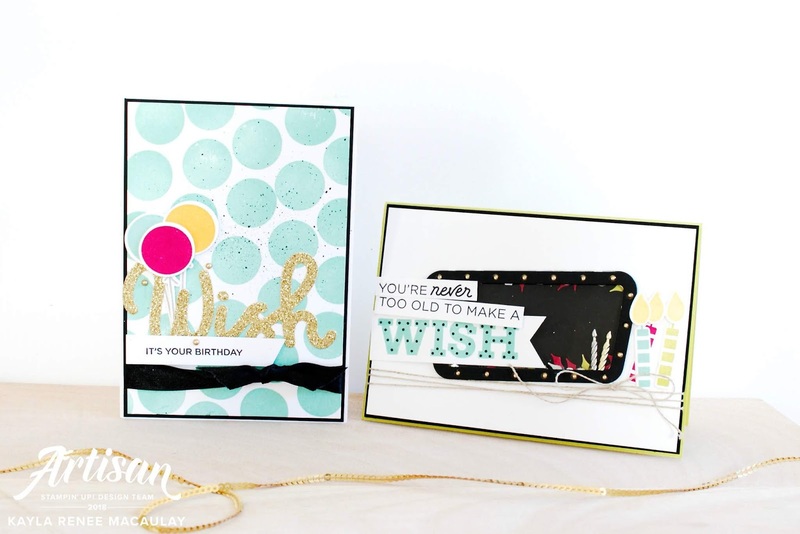 Next I made these two cards and really wanted the focus to be on that awesome 'Wish' die cut. 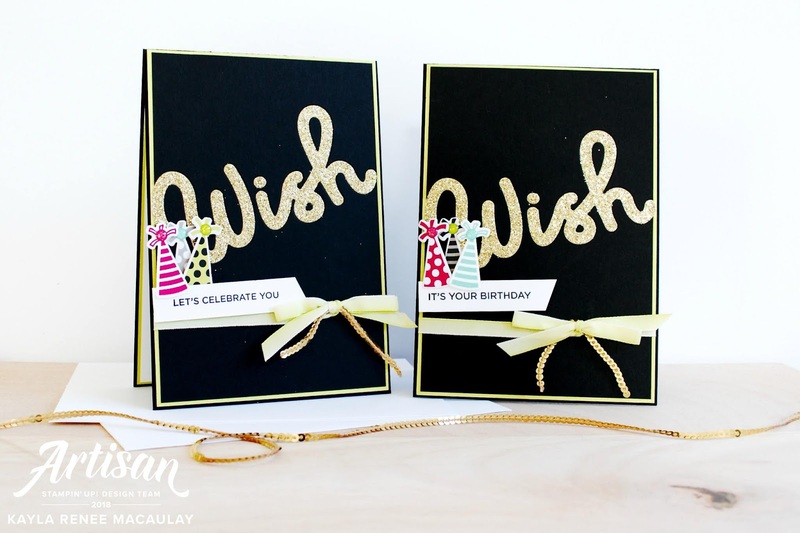 I have actually cut the 'wish' out of the Basic Black Cardstock and then out of Gold Glimmer and inlaid the Gold Glitter Wish die cut back into the Basic Black Cardstock. This is called and inlaid technique and I love doing it when really wanting to keep the card flat and make it a focus and feature of the card. I have accented the card with some party hats cut out with the coordinating die from the Designer Series Paper which have been accented with some more Glitter Enamel Shapes. I finished the card with some Mini Gold Sequin Trim and some Lemon Lime Twist Ombre Ribbon. It was a really fun and simple card using minimal supplies. Here's a close up look at these cards finished. Hopefully you can see from this angle how the 'wish' is sitting in the card as it's laid back into the 'negative' space from the first cut. I am going to use this technique more often as I love it. Here's a look also at the matching inside I stamped for these cards. I am loving the bright and boldness of the Lovely Lipstick. It's fast becoming another of my favourite colours. I hope you enjoyed looking at my projects today. 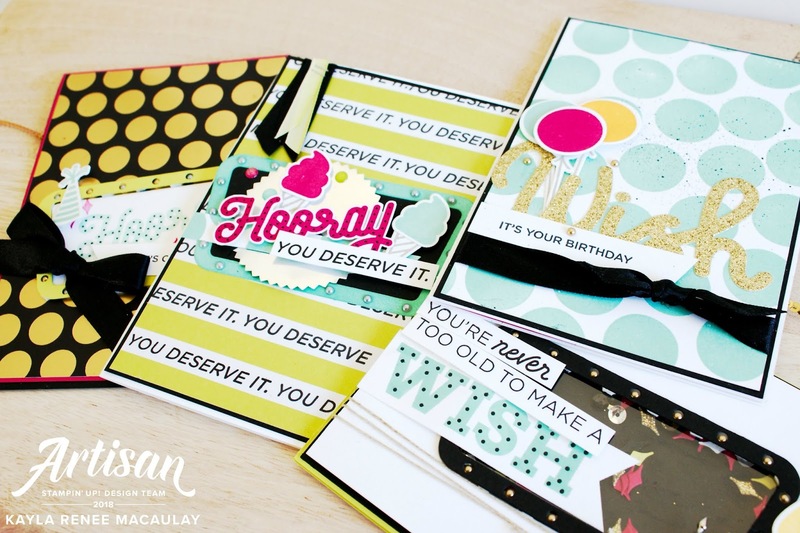 Be sure to pop on to all the other Artisan blogs to see what they have all created with this super fun suite. The next blog is the lovely Kim McGillis with her gorgeous work.